I normally don't like to post too much on discs that aren't readily available in the USA (and much of the world) but I do make exceptions when the situation warrants, and now that I have finagled a copy, it's time to extol the virutes of Sparkwood's Kaleidoscopism. 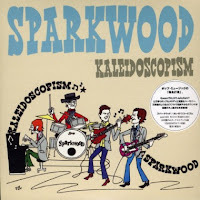 If you're familiar with the Texas band Sparkwood, it's no doubt due to their great 2005 disc Jalopy Pop, which made my 2005 top 20. Kaleidoscopism is cut from the same cloth, falling somewhere between the pop smarts (and smart alecks) of Fountains of Wayne and the effervescent vibe of Jellyfish with touches of Queen and ELO. In fact, their sound can almost be summed up by a single song: Queen's "Good Old Fashioned Lover Boy", a cover of which they've thoughtfully added to the disc as a bonus track. The opener "Welcome" isn't a 30-second introductory track but rather nearly 5 minutes of what could be described as the Beach Boys meet Jellyfish. "Ooh Sha La" sounds like what its title implies: a bouncy, peppy number that will stick in your head. But as earworms go, nothing here tops "The Bop Bop Song", another title that speaks for itself and where the Jellyfish comparison is most apt. And they pull off the slower numbers with aplomb as "Glaze In My Eye" and "Days Ago" close the disc (at least the proper non-bonus portion of it) in fine fashion. But as I alluded to in the opening paragraph, there's a catch. Kaleidoscopism was only released in Japan, and frontman Bart Padar informs me that there is no domestic release planned at this time. So if you want it, you'll have to shell out import prices. But I've done the dirty work for you and found the cheapest US price on the net, $20.73 plus shipping from an eBay seller - not cheap by any means, but better than the $30-35 it's going for at Amazon and CD Universe. I can say that if you loved Jalopy Pop, you'll feel you're getting your money's worth, and given the time of year perhaps you can get someone to buy it for you as a Christmas present. In the meantime, you can stream three tracks at their MySpace. Now here's something that's cool on many levels. Earlier this year, Adam Miner put out a great disc, Dangerous Eyes, which I unfortunately gave the shortest and quickest "CD of the Day" review (it deserved a bit more ink). That certainly would be accomplishment enough for any artist. But no - Miner has recorded another disc, one he was working on before and after Dangerous Eyes, and as an early Christmas present he's giving it to the world for free. 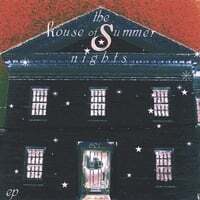 And while normally you get what you pay for, Playing House is not a bunch of leftovers or tracks that aren't worth shelling out for - it's a cohesive, high-quality disc of its own. As his press release states, Playing House is "his Sgt. Pepper-sized solo record in homage to the most influential rock band of all time" and "stays faithful to the psychedelic spirit that producer George Martin and the Fab Four invoked during that golden age of pop." In contrast to Dangerous Eyes, which had a real production sheen about it, Playing House is more homespun sounding. Which is not to say low-fi, just a bit warmer and laid-back. There are a number of highlights - "I Myself and Me", which has a bit of an "Obi-La Di, Ob-la-da" beat on the chorus; the largely acoustic "Honie Please", which calls "Blackbird" to mind; the "Penny Lane"-ish "Pinery Park", "Ogdred Weary" which sounds like a McCartney White Album outtake, and the rocking "Get In My Space". Best of all, it's free for download from his official site. Make sure you also get the Sgt. Pepper-like cover artwork, where you can have fun picking out the 21st century celeb photos he's assembled. NOTE: It appears that the first track may cut off at 39 seconds. I'm waiting an email response back to see if that's intentional or not. UPDATE: It's been fixed. And it's a quality track as well. A couple of quick eMu adds. Twinklehead-Made For These Times. Fun light pop from Norway - see more here from Not Lame. The Tyde-Twice. The oustanding second disc from these LA poppers was one of my favorites of 2004, and it includes the great track "Go Ask Yer Dad". I generally always include the album cover for each disc I feature as CD of the Day; picutres always liven up a site and it's nice to keep the visuals in this age of digital downloads. 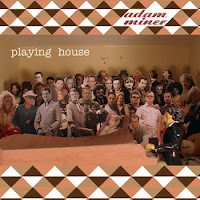 But sometimes the album cover serves more than a decorative purpose. Quite often it can almost serve as a substitute for the review itself; in many instances, you can judge a disc by its cover. 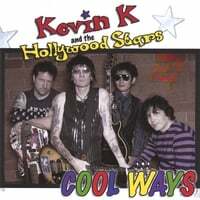 One look at the cover of Kevin K's Cool Ways above and you can pretty much guess the sound. This is old-school power pop. And I mean "old school", as Kevin's been around since the beginning of the 1980s and Cool Ways is his 16th disc. 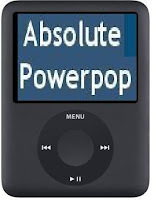 Nevertheless, his profile in the power pop community has been low (no sign of him at the Not Lames and Kool Kats, although he seems to be in popular in Europe as evidence by a best-of released in Europe). I'm not sure why, because if Cool Ways is indicative of the rest of his catalog, we've been missing out on a good thing. "She's Got The Look" and the title track open the album in highly melodic, rocking fashion, reminding me quite a bit of Silver Sun. "Makeup and Breakup" has a Cheap Trick feel, while "Getaway" borrows a line from The Replacements' "Talent Show" ("feeling good from the pills we took") and brings in some sax. "Night of the Living Dolls" has more of a punk feel, and although Warren Zevon beat him to the topic 20 years ago with "Detox Mansion", "Rehab" is still a searing sendup of pampered Hollywood stars and their addiction to rehab. Just listen to the samples at the CD Baby and wait for the smile to come to your face. Cool Ways certainly is, and you'll be asking yourself why haven't I heard of this guy before? Foreign Films (among others) added on eMusic! Eagle-eyed reader Al M. has alerted me to the fact that The Foreign Films' Distant Star is now on eMusic. It's a contender for the year-end top spot, and normally I don't advocate using up 22 of your monthly downloads on a single disc, but I'm making an exception here. He also pointed out that Robo Sapiens, the new disc from Roger Joseph Manning Jr's electronic project, Malibu, is on there as well. Not to mention a couple I managed to find by myself: The Resonars' Nonetheless Blue, a fine psych/jangle pop disc that has been on the front page of Not Lame for weeks, and the Michael Harrell EP, Greetings From The Village, that I featured last month. Buongiorno, Under The Tangerine Tree! And if I were feeling ambitious, I could list a few of the top tracks. So when it comes down to it, language really isn't a barrier. Anyway, they've got some nice selections on this site, including a couple of Americana discs I've been digging lately (Seven Doors Hotel and Far From Kansas). Check it out! Smith & Hayes on eMusic! Smith & Hayes' Changed by a Song was added to eMu this morning. I'll say it again, if you're into Beatlesque songs in the manner of David Grahame, jump all over this one. 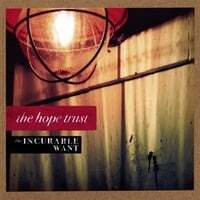 The Hope Trust is Denton, Texas' Kelly Upshaw, and he's hit my musical sweet spot here with a mix of pop and Americana. His MySpace likens his sound to a mix of Neil Finn and Wilco, and it also reminds me of personal favorites like The Latebirds and Additional Moog. There are highlights aplenty. "Break You Down", with its melodic mid-tempo sound buttressed by a tasteful pedal steel, could have fit right in on Bob Evans' Suburban Songbook; "Run It Through" and "Two In The Bush" bring to mind Joe Pernice's earlier days in the Scud Mountain Boys and his Big Tobacco solo disc (in fact, Upshaw sounds like a huskier-voiced Pernice). Meanwhile, "OK, Alright" is where he leans to the Neal Finn side of his sound, if Finn used pedal steel in his songs, and "Parting Shot" is where the Wilco comes in, at least the Wilco of the Summerteeth era, and "Don't Want to Fight" is straight ahead roots-influenced rock in a Wallflowers/Minibar vein. This is high-quality stuff, and if your musical tastes run in this area, The Incurable Want is (to coin a phrase) extremely highly recommended. Pearlfishers (and more) on eMusic! The most excellent Pearlfishers release, Up With The Larks, was added to eMusic today, as well as a CD single for "The Umbrellas of Shibuya", which features the Larks single along with two non-album tracks, once of which is the fine "Everybody Knows It's a Dream". Also added is one of the year's top EPs, The Treasury, which we raved about a couple of months back. Finally, I neglected to mention last week that the Pillbugs' Rainbow Quartz debut, Monclovia, was added as well. This is kind of a "best-of" The Pillbugs' three independent releases, along with a couple of new tracks. Ah, the 90s. Aside from being a decade of relative peace and prosperity, it was the last decade in which you could reliably turn on the radio and hear decent pop/rock from bands like The Gin Blossoms, Collective Soul, The Wallflowers, Del Amitri, Fastball, Better Than Ezra, etc. Nowadays the only time I turn on the radio is catch a sporting event while I'm out driving. The point I'm making here? Actually, I'm not sure I have a point. 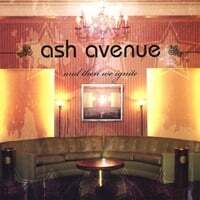 Oh yeah - if this were the mid-90s instead of the mid-00s, a band like Chicago's Ash Avenue would have a good shot at some decent radio airplay. Instead, they'll have to rely on touring, word-of-mouth, the internet and the kindness of strangers. If And Then We Ignite, the band's debut disc, doesn't take you back to the days when Clinton was in office and Bush wasn't (WARNING: analogy only valid for the next 14 months or so), then I'm not sure what will. Anyway, hit radio's loss is your gain here: 12 tracks of quality tunes that straddle the line between power pop and what is now called "adult alternative". "Mistake Me Home" gets things going with a driving sound that's somewhere between the Gin Blossoms and the poppier moments of The Replacements; "Disposable King" is a mid-tempo beauty which wouldn't sound out of place with all of those Teenage Fanclub wannabes I wrote about yesterday; "New Year's Day" is almost pop-punk; "Trash Romance" might have Jakob Dylan wondering if he didn't write it; and "Rise & Shine" is a great Heartland-styled rocker that reminds me of the BoDeans. "Big Kids Wanna Rock"-Myracle Brah, Can You Hear The Myracle Brah?